While walking in the woods on a sunny afternoon in August, my then 3 year old daughter found something on the ground that looked liked a brown crunchy ball. Since toddlers are closer to the ground than adults, they tend to see objects there far more quickly than grown ups. Stooping down to pick it up, I found I was holding a 1 1/2 inch, mostly hollow ball with a paper-like shell. Through a hole in it, I could see that it contained a seed-like object in the center held in place by long radiating fibers. I noticed we were standing under oak trees. Assuming that it came from a nearby tree, I wondered what kind of oak made this curious looking seed. Some ten years later, I have finally found the answer to that question. Through a reliable source, I learned that on that summer’s day long ago, my daughter pointed out an oak apple gall. Despite its look, it is not a seed. Galls are plant deformities caused by insects or a fungus. 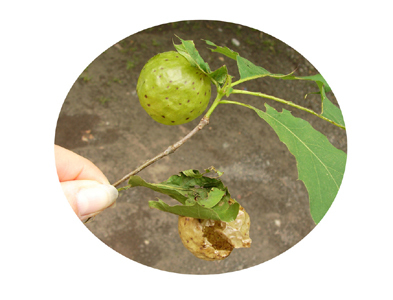 In this case, an oak apple gall wasp caused the oak leaf it grew on to develop into a sphere-shaped fiber mass in which a wasp larva had developed. There are several species of these wasps that create galls. Chemical and hormone interaction between the host plant and larval insect causes the plant to form the gall structure. Galls provide food, shelter, and protection for a developing oak apple gall wasp. Newly forming galls are green with brown spots and feel rubbery. The gall increases in size as the larva grows. Oak apple gall wasps have 2 life cycles, known as alternation of generations, meaning that one generation consists of females that reproduce without fertilization and a second generation that consists of males and females that reproduce sexually. The first generation of the oak apple gall wasp occurs underground within the oak’s roots. Fertile, wingless female wasps develop in the roots over a period of 16 months. In May, these females emerge from underground, crawl up the tree, and inject one or more eggs into the mid-vein of an oak leaf as the leaf emerges in the spring. The developing larvae of this second generation of both male and female wasps cause the leaf to form a round gall. Larvae are located in a hard seed-like structure in the center of the gall. Spongy fibers radiate out of this cell and attach onto the gall’s external shell to hold the larva in place. After the pupating winged male and female wasps emerge through exit holes in the outside shell, the gall drops to the ground where it dries out and turns brown and paper-like. The cast off gall looks like an empty shell with a hole in it where the wasps emerged. After mating with the males, the females burrow into the ground to lay eggs in the oak’s roots to repeat the cycle again. While galls occur on all young rapidly-growing parts of the plant including acorns and flowers, those located on twigs and leaves are most noticeable. Galls are also inhabited by other organisms, although most do not hurt the wasp larva. Galls do not seriously harm the tree. Oak apple galls are so named because they resemble apples.